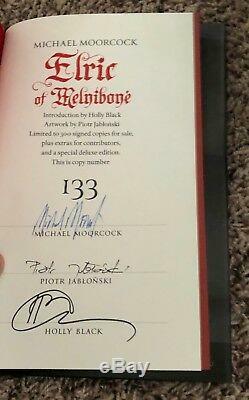 Signed edition is limited to 300 copies, each signed by Michael Moorcock, Piotr Jablonski, and Holly Black. Bound in full black cloth, stamped in three colors. Color illustrations hand-tipped into the book with translucent overlays. Oversize at 6½ × 9½ inches. Head and tail bands, ribbon marker. Howards Conan of Cimmeria is generally credited with starting the boom in heroic fantasy that began in the late 1920s and has been with us ever since. He spawned lots of imitators. Lots and lots of imitators. In any event, after thirty years of Thongors, Elaks, Kyriks, Duars, Donters, Braks, Whacks, Thugs and Thwacks, readers were sick of it. Somewhere along the way the writers (with the exception of the redoubtable Fritz Leiber) had forgotten all about the sorcery part of the equation, leaving the basic plot being the lumbering oaf facing off against the frail but far smarter and more powerful sorcerer, who in some act of hubris would manage to screw everything up and wind up with his head in a bag. To save us all, a young man from England arrived on the scene in the rather unlikely place of the pages of John Carnells. Michael Moorcock wrote stories about a character that, without his soul-drinking sword, was too weak to raise himself off the couch. Readers had never seen anything quite like the albino prince before and initially werent sure what to make of him. Playing on the theme of the Ultimate Outsider, Moorcocks protagonist wasnt even human in the strictest sense. By the time the second novella saw print the readership had made up their minds: they loved Elric! Lancer Books brought out a two-volume set of Elric stories in 1967. Gathered up the short stories. More Elric work followed, such as. The Sleeping Sorceress, The Weird of the White Wolf. And numerous other short stories, novellas and novels. Now, for the first time, the titles, contents, and order of the Elric stories appear exactly as Michael Moorcock has long intended, making the Centipede Press editions (ultimately 9 volumes, with a tenth volume of archival artwork) the most definitive sets of these books ever made available. With gorgeous illustrations and featuring guest introductions from some of the top writers in the field. Each volume will be signed by the author, introducer and artists. Elric of Melniboné, The Fortress of the Pearl. The Sailor on the Seas of Fate. Via the add to cart button at right will secure all matching numbers for every book in the series. The complete contents pages of each book are shown below, as well as each books dustjacket, title page spread, and one of the interior illustrations. Includes the novel of the same name and two short stories: Master of Chaos and And So the Great Emperor Received His Education. It also has an introduction by Holly Black and new artwork by Piotr Jablonski. Signed edition is limited to 300 copies, each signed by Michael Moorcock, Tom Kidd, and Neil Gaiman. Finally, one of the true classics in the sword and sorcery genre gets the deluxe presentation that it has always deserved. For starters, lets begin at the beginning with thanks to two editorial geniuses one in the UK and one in the US. The 1950s was the heyday of the digest magazine, the successor to the pulps of a previous era. There were a lot less titles published as the digest magazines had a new and formidable competitor for entertainment in leisure hours, more and more homes were installing televisions and while the most obvious victim of the TV revolution was the movie theater, the printed word and the expense of same was also having a rough go of it. As is often the case there were blessings in disguise, the 1930s and 1940s saw the worst aggregate of bad fantasy and science fiction to ever see print. Editors were so desperate to fill magazines that even some of the worst hacks of the time bragged about placing 90% of their output. In the era of the digests, editors were having none of it and dozens of the old guard fell by the wayside losing their positions to writers who could actually write. Garnered a lot of attention, but real fans knew that the best stuff would find its way to John Carnells. There was no denying the supremacy of. The Magazine of Fantasy & Science Fiction. But editor Cele Goldsmith had quietly turned. From bottom-feeders to impressive publications featuring great science fiction in one and remarkably good fantasy in the other. It should surprise no one that Michael Moorcock immediately found a home for his Elric stories with Carnells. We Yanks had to wait about a year longer for Ms.
Goldsmith to start publishing him. The early Elric stories were gathered in a Lancer paperback under the title of. This led to a follow-up novel. Which apparently brought things to their logical conclusion. Indeed, theres an anarchistic raging against the machine in the early Elric stories that is almost palpable to the point that there are more than a few of us scholars of the genre who believe that Moorcock needed his time with the pioneers of space-rock, Hawkwind, just to mellow out a tad. What Michael Mooorcock has done is evolve from the angry young man who gave us. To the witty and sophisticated author who is now considered one of our greatest living fantasists, and the Elric character has grown with him. Moorcock simply realized that there was far more to Elrics story and how he grew from the spoiled princeling with a huge sense of entitlement to the doomed and noble figure he becomes in the end. Is Moorcock now at the height of his prowess as a novelist revisiting the early history of a young Elric. The stories and novels that Moorcock wrote to fill in the blanks in the Elric saga are very obviously necessary pieces of the puzzle that had been left out. Without these revisions, it is literally impossible for the Elric of. To become the Elric of. The complete contents pages of each book are shown below. The titles, contents, and order of the works appear, for the first time, exactly as Michael Moorcock has long intended, making these the most definitive sets of these books ever made available. The Fortress of the Pearl. Includes the novel of the same name and one novella The Black Blades Song. It also has an introduction by Neil Gaiman and new artwork by Tom Kidd. SAILOR on the SEAS of FATE. Signed edition is limited to 300 copies, each signed by Michael Moorcock, Richard Hescox, and Michael Chabon. Crossovers between an authors most popular characters occur but rarely, with some of the most intriguing possibilities left untouched or else picked up by other writers practicing the form of literary pastiche. Arthur Conan Doyle never had the cerebral Sherlock Holmes consult on a case with the explosive Professor Challenger. Indeed, most authors avoided the idea entirely, or gave it remarkably short shrift. Howard brought Bran Mak Morn and Kull of Valusia together briefly in Kings of the Night. Moore had her Jirel of Joiry meet up with Northwest Smith in one memorable story. But only Michael Moorcock had the genius and audacity to bring. Of his major characters together in a full-length novel and then play the trump card that reveals the four characters to all be in effect. As different spokes of the cosmic wheel, avatars of the Eternal Champion. Moorcock brings together Prince Corum Jhaelen Irsei, the Prince in the Scarlet Robe, (protagonist of six novels), Erekose, (the titular hero of The Eternal Champion and four other novels), Dorian Hawkmoon, the lead of nine volumes which incorporate the two series. The History of the Runestaff. , with his lead character Elric of Melniboné. What we do have here, is the stripped down, essential Elric, with this being the third of the Essential Elric volumes, lavishly illustrated and finally presented in the sort of fine volumes that the work has always demanded. Includes the novel of the same name and two short stories: The Dreaming City and A Portrait in Ivory. It also has an introduction by Michael Chabon and new artwork by Richard Hescox. The item "Elric of Melnibone SIGNED Michael Moorcock Centipede Matching #' HCs IN HAND NOW" is in sale since Monday, January 28, 2019. This item is in the category "Books\Antiquarian & Collectible". 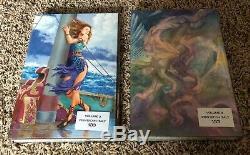 The seller is "badmoonbooks" and is located in Chino, California. This item can be shipped to United States, Canada, United Kingdom, Denmark, Romania, Slovakia, Bulgaria, Czech republic, Finland, Hungary, Latvia, Lithuania, Malta, Estonia, Australia, Greece, Portugal, Cyprus, Slovenia, Japan, Sweden, South Korea, Indonesia, Taiwan, South africa, Belgium, France, Hong Kong, Ireland, Netherlands, Poland, Spain, Italy, Germany, Austria, Bahamas, Israel, Mexico, New Zealand, Singapore, Norway, Saudi arabia, Ukraine, United arab emirates, Qatar, Kuwait, Bahrain, Croatia, Malaysia, Brazil, Colombia, Panama, Jamaica, Barbados, Bangladesh, Bermuda, Brunei darussalam, Bolivia, Ecuador, Egypt, French guiana, Guernsey, Gibraltar, Guadeloupe, Iceland, Jersey, Jordan, Cambodia, Cayman islands, Liechtenstein, Sri lanka, Luxembourg, Monaco, Macao, Martinique, Maldives, Nicaragua, Oman, Peru, Pakistan, Paraguay, Reunion, Viet nam.